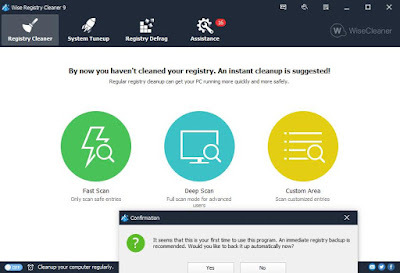 You can clean registry junk, repair windows errors, and keeps your computer at peak performance with Wise Registry Cleaner Freeware. Your PC can crash if you do not clean registry files accumulated with the usage of windows. The performance of your system will decrease with obsolete items increase with registry files. Wise Registry Cleaner scans your PC for Windows Registry and tries to find if there are any error residual items. After that Wise Registry Cleaner cleans or defrag. Your windows will run faster and stable after removal of these residual and corrupted registry files in windows registry. Before, when cleaning is done, Wise Registry Cleaner automatically backup registry. You can restore the registry to its previous point with the help of backup, in case if anything goes wrong. With this free software, you can create a full registry backup or system backup manually. This can be done before making any changes to system or network configurations. Wise Registry Cleaner offers you to create a registry backup when you run this program for the first time. 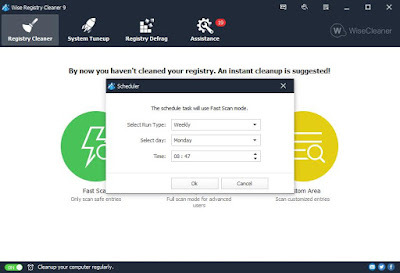 You can set Wise Registry Cleaner to clean the registry on daily, weekly, monthly, on idle or at log on, schedule accordingly to your own need, from its main interface. When the scheduled time is up, Wise Registry Cleaner will automatically clean up the registry in the background. You can also create an icon named “Clean with 1-click” on the desktop from the settings. Without opening Wise Registry Cleaner, you can clean the registry by clicking on the icon, with this feature. 1. Optimize prefetch parameters to improve Windows boot-up speed. 2. Reduce application idleness at closing to improve the shutdown process. 3. Disable cleaning Windows Paging File at shutdown to speed up shutdown. 4. Enable optimization future to improve Windows boot-up speed. 5. Disable automatic reboot when the system encounters blue screen of death. 6. 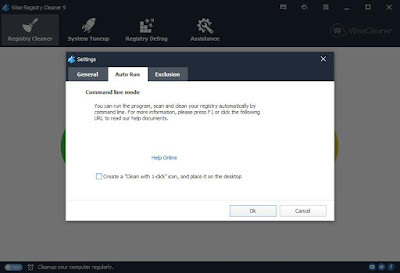 Disable registry modification from a remote computer. 7. Set Windows Explorer components to run in the separate process avoiding system conflicts. 8. Automatically restart the Windows Explorer to stop an unexpected desktop disappearing. 9. Close frozen processes to avoid system crashes. 10. Optimize refresh policy of Windows file list. 11. Speed up display speed of Taskbar Windows Previews. 12. Speed up Aero Snap to make thumbnail display faster. 13. The optimized response speed of system display. 14. Increase system icon cache and speed up desktop display. 15. Boost the response speed of foreground programs. 16. Boost the display speed of Aero Peek. 17. Disable memory pagination and reduce disk I/O to improve performance. 18. Optimize processor performance for execution of applications, games, etc. 19. Close animation effect when maximizing or minimizing windows to speed up the Window response. 20. Optimize disk I/O while CPU is idle. 21. Disable the “Autoplay” feature on drives to avoid virus infection/propagation. 22. Optimize disk I/O subsystem to improve system performance. 23. Optimize the file system to improve system performance. 24. Optimize front-end components (dialog box, menus, etc.) appearance to improve system performance. 25. Optimize memory default settings to improve system performance. 26. Disable the debugger to speed up error processing. 27. Disable screen error reporting to improve system performance. 29. Optimize DNS and DNS parsing speed. 30. Increased max connections per server. Web page viewing speed and online video watching speed enhanced. 31. Optimize Ethernet card performance. 32. Optimize network forward ability to improve network performance. 33. Optimize WINS name query time to improve data transfer speed. 34. Improve TCP / IP performance through automatic detection of “black holes” in routing at Path MTU Discovery technique. 35. Optimize TTL (Time to Live) settings to improve network performance. You can download Wise Registry Cleaner from here.